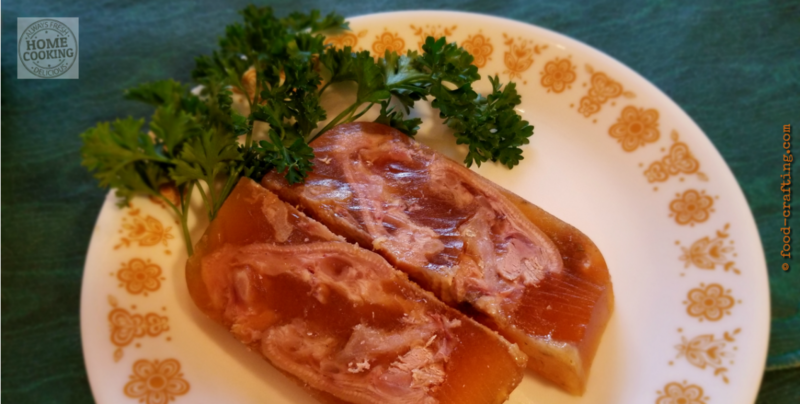 Jellied Pigs Feet Recipe – Appetizer or first course! 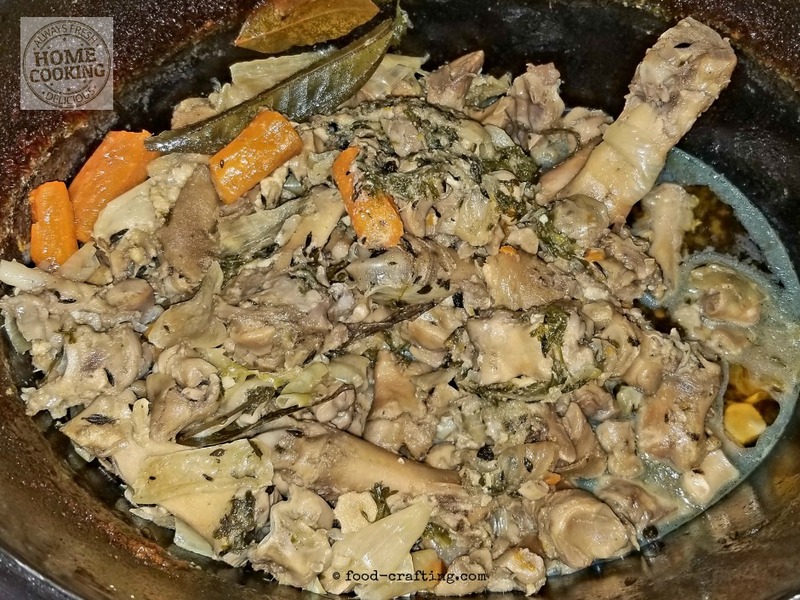 This past Saturday, I cooked a pigs feet crock pot recipe to fall-off-the-bone tenderness. The idea was to prepare boneless portions of meat for Mom to coat in mustard, bread and then pan fry to a golden brown. As I deboned the pig’s feet, I thought of the best method to keep the meat from drying out until ready to bread. Why not keep the pieces in their own broth or, better yet, in their own gelatin? With the vegetable infused broth still in the slow cooker, I placed all the bones back in the pot, added 3/4 cup apple cider vinegar (or about 5% of the total volume of liquid). Set it to cook on LOW for another 2 to 3 hours to reduce the broth to its most intense flavor. Can we call it pickled pig’s feet? Yes and no. My original recipe was prepared with the whole pig’s feet, split in two. I imagine pickled pig’s feet to be cooked using the hock portion of a pig’s leg with the meat (the entire hock). Once cooked, it is packed in a vinegary liquid – using a larger ratio of vinegar to broth than I used to prepare this jelly. When cooled, remove the bones from the broth with a skimmer and ladle the remaining broth through a fine mesh sieve. My favorite all-purpose cooking strainer or sieve has 3 layers of fine mesh to catch even the smallest bits except the pepper! But the most important feature in my mind are the two smaller grips that support the sieve on the rim of the pan. 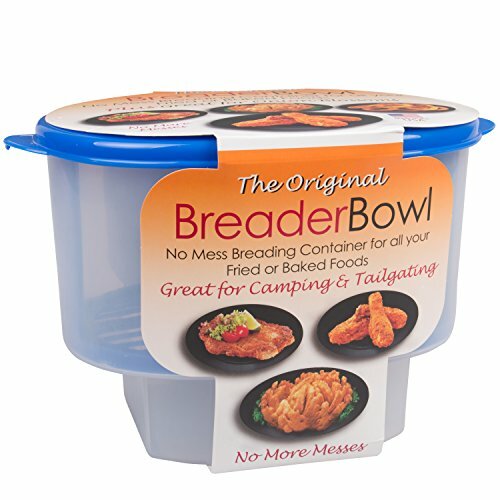 Buy A Good Quality Strainer! Get yourself a sieve that has a a wide sturdy grip and at least a double mesh layer. This one has a superior design! What you want is a stable strainer so your sieve does not flip on you when unevenly filled. Been there, done that! All that was left was this glorious rich bone broth gelatin. It set almost instantly as it cooled in the pan while I was separating the solids from the liquids! Place in the refrigerator to cool for about 1 hour. 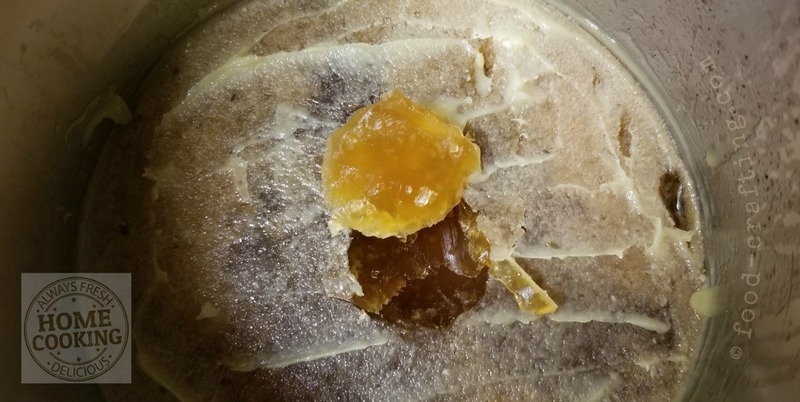 The jelly is so dense that you can easily scrape any fat off the surface with a small spatula. I was surprised to find that the layer of fat was very shallow. Un-mold the jellied pigs feet onto a flat plate (I used a nice pasta plate for photo purposes) and cut into thick slices. A regular serrated kitchen knife sliced through the jellied meat very easily to produce the neat slices pictured below. Why Not Cube The Meat? The original purpose for the gelatin was to make sure the pig’s feet remain moist and travel well the following day. The portions of meat were packed in the glass dishes I regularly use to prepare Mom’s weekly meals. 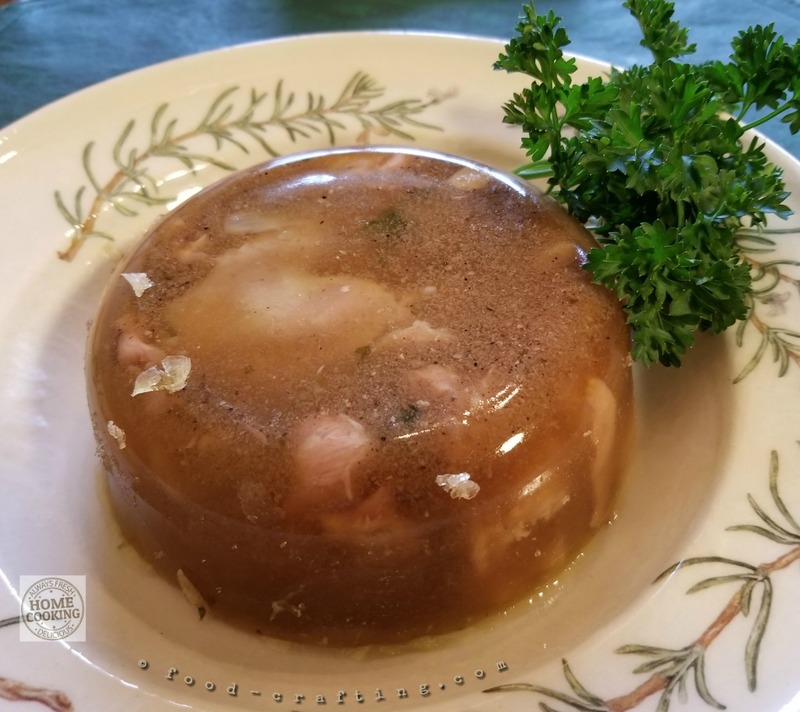 The resulting jellied pig’s feet recipe was totally secondary to my objective but resulted in two very different meals for both Mom – with more than enough for me! As someone who grew up eating French charcuterie and German homemade deli meats and sausages, head cheese is not foreign to my taste buds. To prepare an appetizer type mold, chop the meat into 1/2 inch pieces. Pack firmly into a rectangular glass loaf pan or mold. Add just enough liquid to cover the pieces of meat. Allow to settle and add more liquid if needed. Cut into 1 inch thick cubes and add to a charcuterie platter as an appetizer. Serve with Dijon mustard. How’s that for looking at a recipe from two sides of the culinary spectrum? To serve the slices of jellied pig’s feet, I prepared a potent vinaigrette. We’re used to the original recipe but for this purpose, you want to kick it up several notches. Let me settle one thing up front… when I mention vinaigrette, I am not comparing it to any bottled vinaigrette found in the Salad Dressing aisle at your local supermarket. I do not use any sugar in my vinaigrette. Jump to the recipe for our home style vinaigrette. To serve the jellied pigs feet recipe, I basically doubled the amount of seasonings I use in a regular salad dressing. Why didn’t I take a pic of the dressing? No clue but I was multi-tasking yesterday – preparing several meals for Mom. Technically, pig’s feet prepared “à la vinaigrette” are marinated for hours or overnight in a very potent vinaigrette. I decided not to go that route. Instead, I spooned some directly on the thick slices of jellied pig’s feet. So, pieces of meat marinated in the vinaigrette or vinaigrette spooned on the jellied meat must be equally delicious – especially when accompanied by a slice or two of fresh baguette and a glass of red wine! Here is another favorite treat for apéritif time. All you need are slices of baguette, some crisp cornichons and a container of Rillettes de Porc. 1.1 Buy A Good Quality Strainer! 2 Why Not Cube The Meat? Previous Post Smoked Salmon Feta Cake: Make A Savory Appetizer Loaf Next Post Copycat Rib Sandwich: How To Make Easy Boneless Ribs!